Ingrained in the hair and beauty industries for more than three decades world-renowned hairstylist and entrepreneur, José Eber, continues to be a leading authority and influencer in his field. Our team of stylists and colorists are among the best in the industry utilizing the most cutting edge techniques and treatments available. They are talented individuals with a passion for their craft, and a long list of honors and accolades. Many of our stylists and colorists are leaders in their respective areas of expertise, servicing a true celebrity following in addition to their cherished local clientele. In most cases, the stylists have been hand selected by José himself from a large pool of applicants that are drawn to José Eber from all over the world. At José Eber we offer a complete line of hair and makeup services and products. In addition to our world renown cuts, color and blowouts, we are also industry leaders in custom hair extensions and straighteners/relaxers. We use extensions to add beautiful length to shorter hair and volume and thickness to your existing length with no discomfort. We are familiar with all types of hair extensions, and use only Hairdreams hair as well as our own custom handmade hair extensions, integration pieces and wefts of the finest quality human hair available to create a personalized, completely natural look that suits your individual needs. Our expert colorists are more advanced than most educators in balayage, color correction and full color changes. Our expert stylists and makeup artists can prepare you for that red carpet look for the Awards Season, beautifully modern updos for the bride and her bridal party, or a night on the town. Whether you are looking for a modest touch-up or a (complete transformation) makeover, there is no better salon than José Eber. As the most recognized hairstylist in the world, Beverly Hills-based stylist José Eber has had his hands in the hair of Hollywood’s most beloved stars for four decades; something no other stylist has ever accomplished. The salon offers a full spectrum of services to cater to locals, Resort guests and bridal parties, including haircuts, color and highlights, blowdrys and styling and updos. Eber will be personally available for both haircuts and consultations on a regular basis, along with his team of talented stylists who have been trained in the most innovative methods and cutting edge techniques. 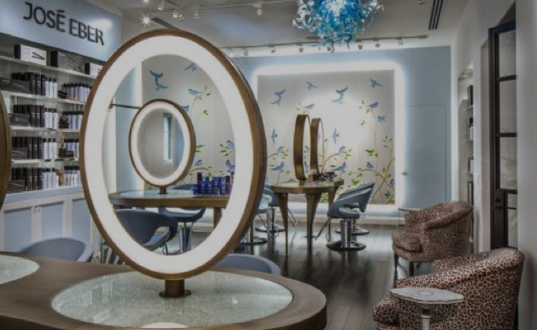 The latest technology and equipment, from three customizable, massaging shampoo stations to advanced heaters that help produce perfect color, further enhance the experience. Professional makeup application, makeup lessons, lash application and brow shaping are also available. The salon carries Phyto hair care products and will soon also feature the José Eber signature line of products and professional tools. Soft lighting and soothing nature hues in the chinoiserie wall panels, neutral charcoal wood floors and eye-catching blown-glass chandelier in shades of blue—custom designed by acclaimed artist Dale Chihuly—reflect Santa Barbara’s coastal environs, beachy aesthetic and natural beauty. Illuminated display cases filled with hair accessories and jewelry line the path clients take to a dressing room area that’s swathed in a gorgeous photo-realistic wallpaper depicting a shimmering padded cell (the wallpaper throughout is divine). 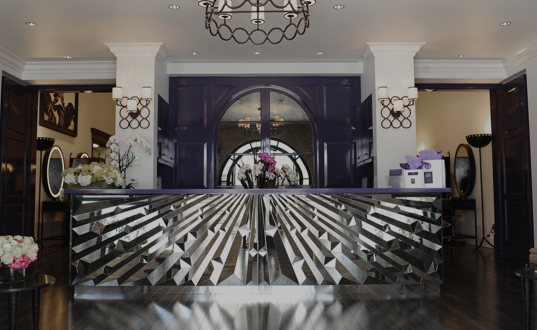 The salon’s second floor features a waxing room, an extension room, a manicure-pedicure enclave featuring tufted, raised thrones, a treatment room inhabited by a beauty pro who does semi-permanent makeup (it lasts one to two years), four rooms dedicated to injectables, Botox, laser and other medi-spa treatments, and the Suite — a private room for VIPs that features its own shampoo bowl, hairdressing station, flat-screen TV, windows overlooking Camden Drive and black-and-purple upholstered seating. If you have inner beauty, it is much easier to find outer beauty. When you see yourself through gentler eyes, you'll see the whole world through gentler eyes.